getting back on the horse – for the umpteenth time! I´ve been away in China for nearly four weeks – and have just spent half an hour on the book after a long lay-off. I just have to work on it because I feel dreadful if I don´t! Co-ordinating your hands when playing the piano isn´t easy: and here´s my visual depiction of it. I did a stylised scribble of hands to show how you number the fingers, and then thought I would rather have a real drawing. 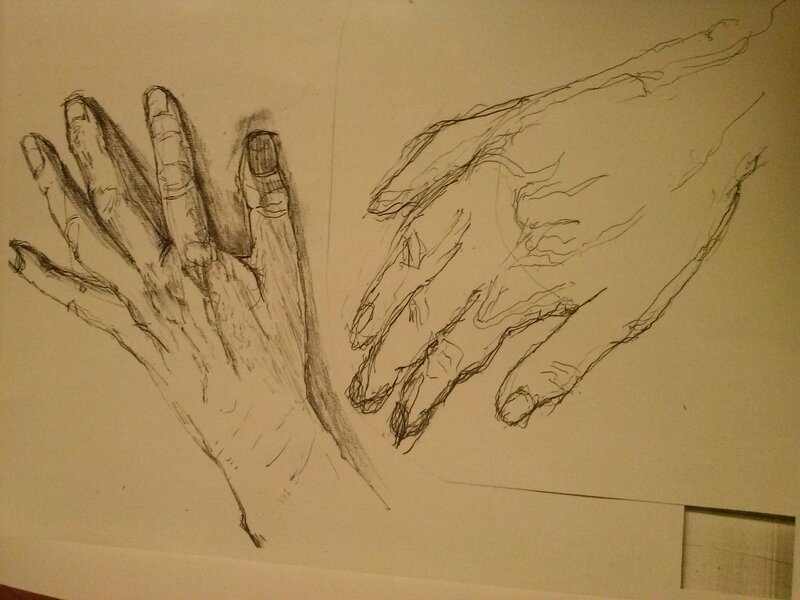 It hadn´t occurred to me that that meant drawing my right hand with my left! (I´m right handed.) The results are so telling: the left hand is recognisable, looks competent and capable: and the right hand looks like the claw of a dinosaur, fraught with uncertainty but also charged with unknown possibilities.